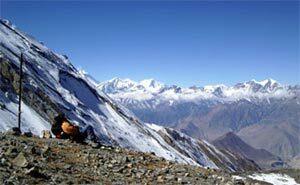 Few places in the world have such a splendid variety of natural beauty as the Annapurna region. It is a rare combination of long arrays of snow-capped peaks, crystal clear lakes, turbulent rivers with deep gorges, Tibetan monasteries, hot -spring, and picturesque villages inhabited by simple and friendly ethnic people. A sacred valley ringed by enormous peaks, the Annapurna Sanctuary is a hidden glacial hollow that shimmers like a jewel in the mountains. This is a trek to a land of enchantment. No one can fail to be pressed by the diversity highlighted on this adventure. The snow-covered peaks of the Annapurna Peaks offer a taste of Nepal’s remarkable pleasures.